I don't know what they give now — hence the past tense. Over the weekend, we went to Mrs. Bashcraft's grandmother's house. Her grandmother recently moved to a new apartment, so there's been a great deal of packing and unpacking. Her grandmother came across this sake cup and was thinking of getting rid of it. It's gold, apparently, and was her late husband's. 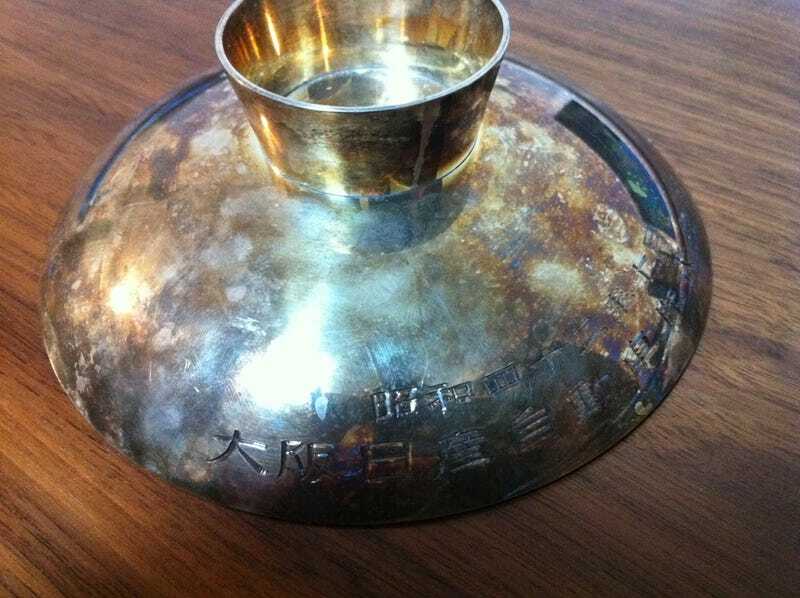 This is the base of the cup, and sake would be poured into the large dish on which it currently rests. Mrs. Bashcraft's grandfather worked at Nissan, and he was given this to mark 25 years at the company. I guess in the U.S., they used to give gold watches? I'm not sure what they give now. Any idea?